Energy Harvesting – LAUX d.o.o. An energy harvesting switch which reacts to its environment without a need for energy. This solution developed by CHERRY is based on the principle of Energy Harvesting and does not require any wires. Energy Harvesting can be described as an ‘operation without any auxiliary energy’. Instead of generating auxiliary energy through an integrated energy source or adding it via an external energy supply, energy that is available in the surrounding environment or that is acting on the system is converted. Therefore an Energy Harvester generally speaking is an energy converter. The wireless RF switch system from CHERRY based on an energy harvester transforms the mechanical input energy of the actuation into electrical energy, which then transmits, for example, a switching signal to a wireless receiver via RF electronics. The advantages of the system are that the switch can be placed anywhere without the need for any wires. Over its whole life cycle it will fulfill its function completely maintenance free and without any need to replace a battery. The RF switch is fed with different input parameters and is capable of reacting to its environment. Structurewise, the overall system with its four main parameters can be divided into two main systems. The supply voltage as well as the load RF-electronics, which itself can be grouped into five sub-systems. Through suitable deflections the operating mechanism is transferring the actuation of the switch into the required force, path and direction of the energy converter. The inductive energy converter consists of an electromagnetic generator which changes the magnetic flux in the coils by a sudden movement of a magnet thus creating an electric impulse through the actuation of the wireless switch module. The electrical energy is then temporarily stored by the energy management unit and then converted, as low-loss as possible, into a predefined supply voltage by a voltage converter unit. This supply voltage powers the RF electronics of the consumer device which sends the radio protocol with all user data via the antenna system to a receiver. 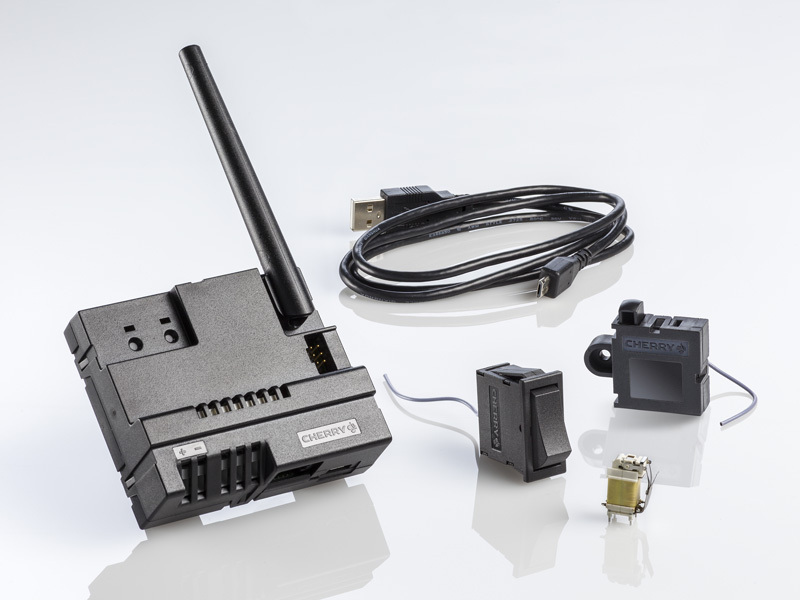 The energy havesting wireless RF switch system from CHERRY can be operated with the frequencies 868 MHz, 915 MHz and 2,4 GHz. For the transmission of the switching information a proprietary and customer-specific protocol can be used but also RF-standards such as KNX-RF, ZigBee or Bluetooth Low Energy.